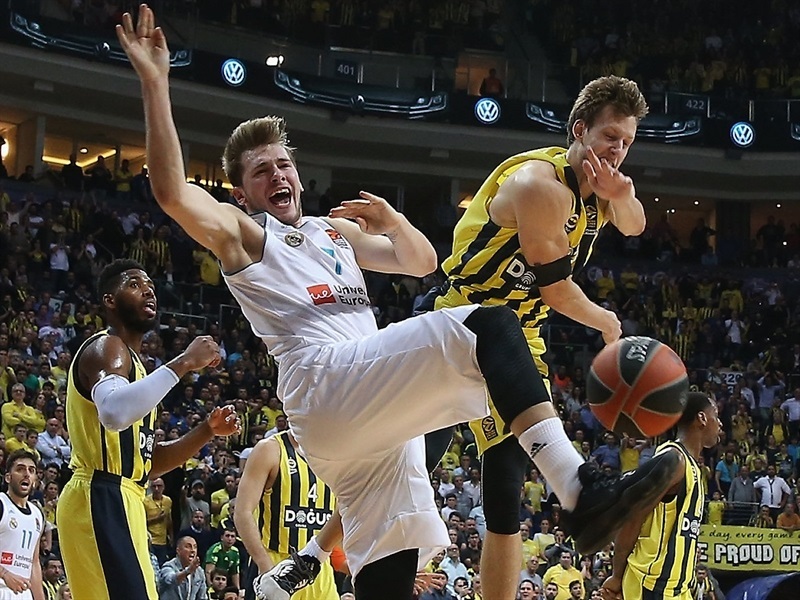 The rivalry between the winningest team in EuroLeague history and the reigning champion saw another chapter written on Thursday as Luka Doncic came within 2 rebounds of a triple-double to lead Real Madrid to a 77-79 road win over Fenerbahce Dofus Istanbul at Ulker Sports and Event Hall. Doncic produced 20 points, 8 rebounds and 10 assists to help Madrid to its fourth consecutive victory, a 9-6 record and a spot in the top half of the standings at the midway point in the regular season. Fenerbahce, which lost back-to-back games for the first time this season, also sports a 9-6 record. 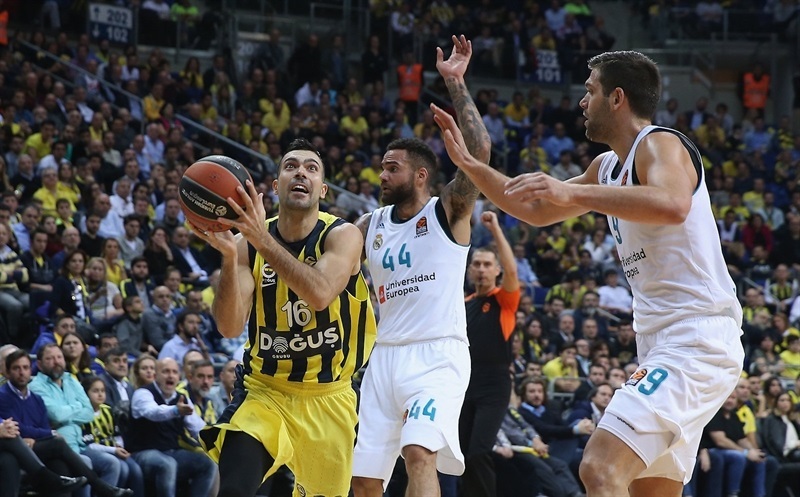 Fenerbahce led by as many as 11 in the first quarter, but Madrid roared back to take a 36-37 halftime advantage. 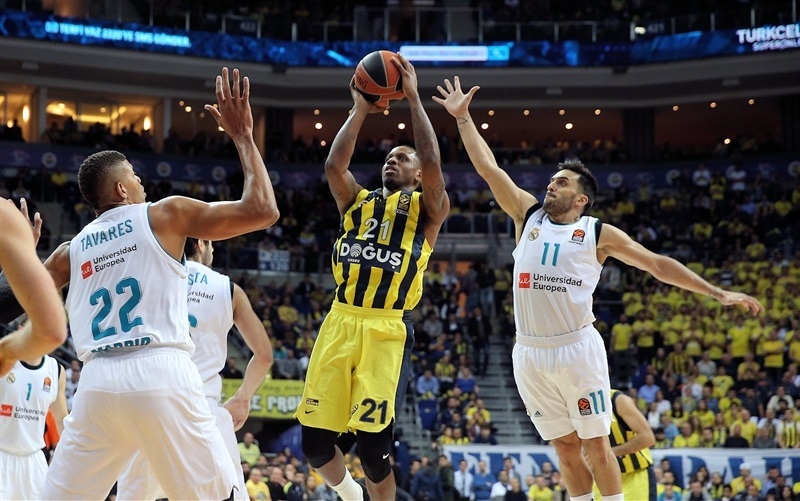 The game came down to the bitter end with the fourth quarter featuring six lead changes and two ties; Brad Wanamaker had two shots in the closing second to tie it, but was rejected once by Trey Thompkins and missed the next shot. 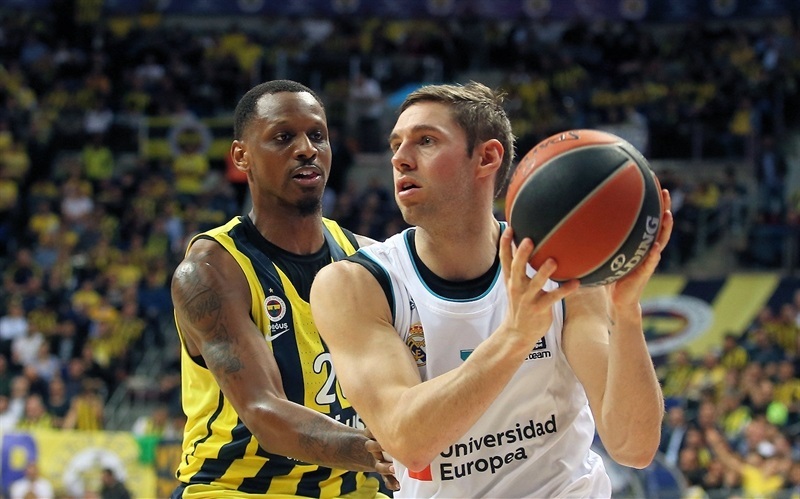 Thompkins and Felipe Reyes scored 13 points apiece for the winners and Jaycee Carroll added 11 for the winners. 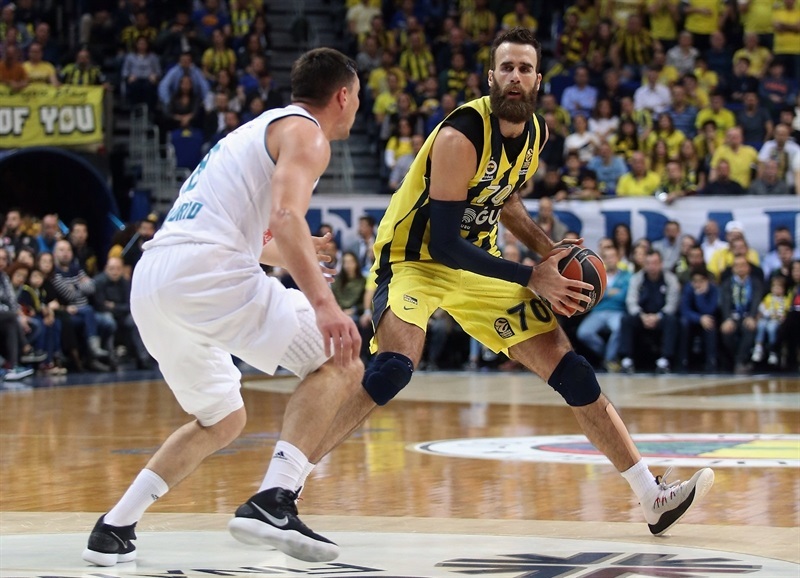 Wanamaker led Fenerbahce with 20 points and 5 steals, Gigi Datome scored 12, James Nunnally 11 and Jason Thompson 10 in defeat. 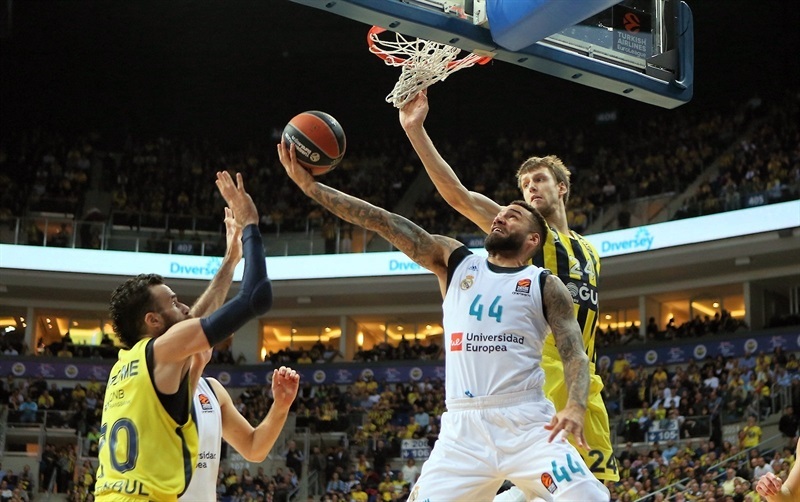 Fenerbahce started strong with threes by Kostas Sloukas and Nunnally and a three-point play by Wanamaker contributing to a 13-6 advantage midway through the opening quarter. Wanamaker free throws from an unsportsmanlike foul by Facu Camapzzo and a bucket by Nunnally put Fenerbahce up 11. Jonas Maciulis ended the Madrid drought with a mid-range jumper and Jeffrey Taylor’s reverse layup drew the visitors within 17-10 after 10 minutes. Carroll drilled a three to open the second quarter, but Ali Muhammed matched him. Carroll stayed hot to keep Madrid close and with Doncic setting up the attack, Taylor nailed a three from the corner to make it 27-25. 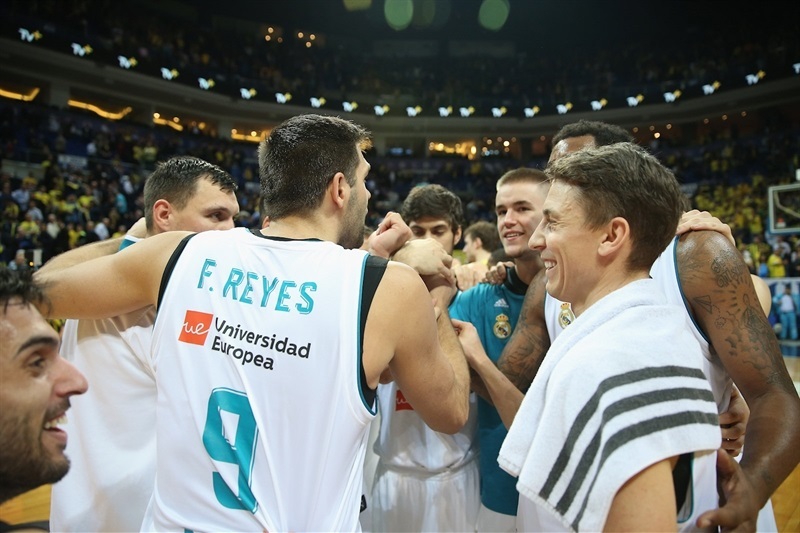 Walter Tavares was ejected for a second unsportsmanlike foul, but Madrid continued to fight back and Reyes tied the game, 32-32, from the line. Madrid took the lead with a Thompkins three-pointer before Wanamaker beat the halftime buzzer to make it 36-37 at the break. Great team passing set up Jonas Maciulis for a triple that put Madrid up 4 three minutes into the second half. Thompson scored twice to tie the game at 44-44 and the hosts edged in front on a Gigi Datome triple, 49-48. Doncic’s first three got the visitors back ahead, 54-55, as the teams continued to battle intensely. After a three-point play by Wanamaker, Doncic free throws gave Madrid a 61-62 edge through three quarters. 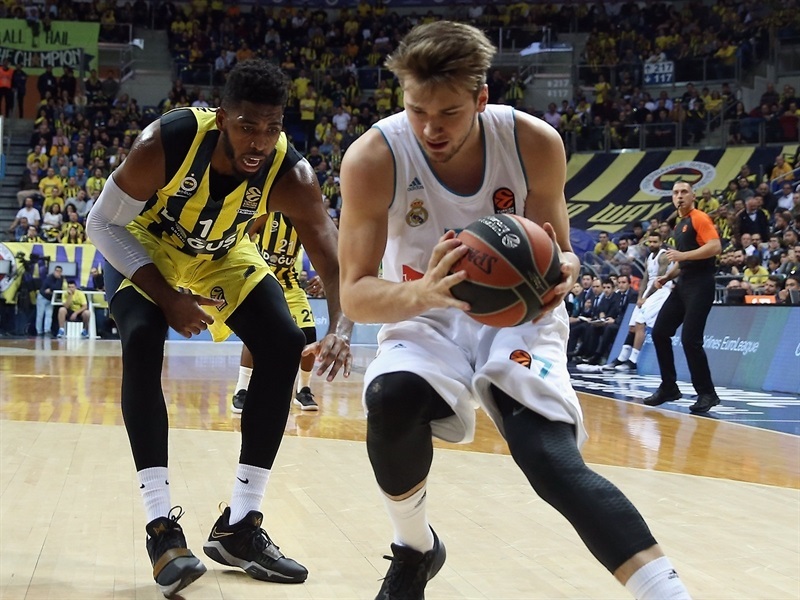 Wanamaker delighted the Fenerbahce faithful with a three to start the fourth quarter, but Madrid went ahead again on Reyes free throws. A three-point play by Thompkins put the visitors ahead 70-74 with 4:15 remaining, but Datome nailed a triple to get Fenerbahce back within 1. However Doncic drew an unsportsmanlike foul from Vesely and proceeded to make 3 of 4 free throws to make it 75-79 inside the last two minutes. 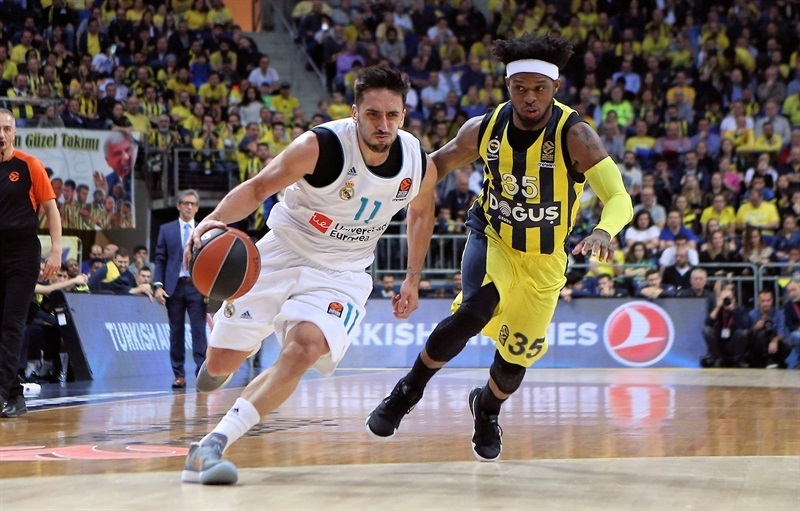 It came down to the closing seconds with Fenerbahce down 2 and with the ball; Wanamaker had 2 shots to tie it, but missed both and Madrid raced home with a clutch victory. "I believe that we started the game tonight in a very positive way. First quarter was as exactly the way how we wanted to play. Everything after that was very bad, apart from some rare moments. After our probably worst game against Maccabi last round, we played another generally bad game tonight. That is a responsibility of the coach. I must understand why it happened, why we repeat mistakes, why we did not have concentration, why we had easy stupid fouls, why we make unsportsmanlike fouls. All the things that are part of the game. Everything is on me. That’s my job. Also, we have problems moving the ball, and that’s a responsibility of everybody, not just one or two players. Thanks for the fans for the excellent atmosphere. It hurts me very much they come, they trust us, and we [played like that]. I hope that will change. 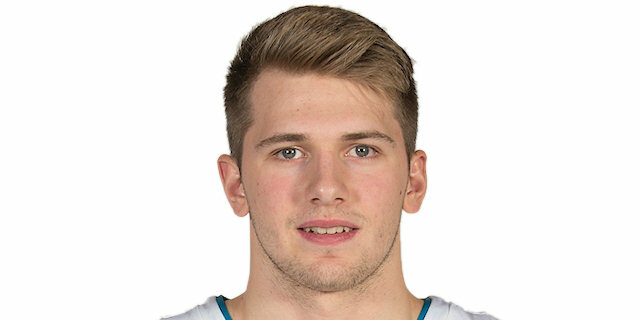 Luka Doncic played an excellent game, like he plays most of the season. 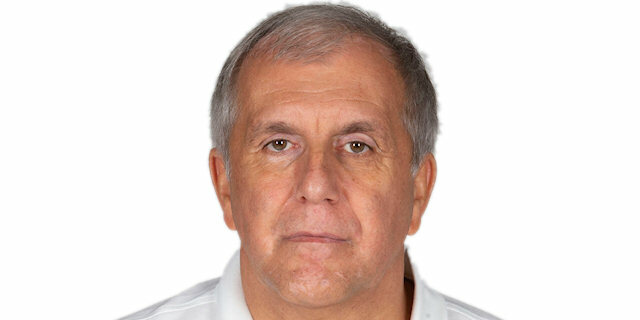 Congratulations to him, and to the staff of Real Madrid on the victory." "I think we were very patient. We played with a lot of heart and stayed in the game in good and bad moments. Defensively we were solid. We suffered a bit on the offensive boards when they had their big squad and we didn't have bigs in. But we were able to move the ball around and find open jumpers. We're happy because we kept a very good spirit going for 40 minutes. Eddy [Tavares] is a guy who gives us a lot of things, defensively and offensively, close to the basket. So without him we had to play with Felipe [Reyes] and Trey [Thompkins], who did a great job, Maciulis also playing inside for a little bit of small ball. We had to be patient attacking and making the extra pass to find the open jumpers. We didn't have a great percentage on the three-point line, but I think we were under control most of the time. We feel good. We know how long and difficult this EuroLeague regular season is. Last year we were 23-7. That was great. We played great moments, were solid during the whole year, had less problems than this year. We knew that this year we were going to suffer, and we know how difficult every game is. So we're happy to be back on the victory road, but we know we still have a lot of work to do." "It feels great, especially here. It was a very difficult game. At the end we suffered, when they had the last shot. I think we did a great job the whole game, so we need to continue like that. I think we shot the ball good. The keys for us are rebounds, playing hard defense, passing the ball and shooting well. And we did those things."